A world of old rocks and dead trees rattled past outside Elenna’s windows, as the cold steel tracks led her inexorably onward from one town to the next. The train shook around her and through her, each vibration running from the levers and pulleys among which she hung, along her uselessly dangling legs and her slender arms, like another pulse beating alongside her own. For a moment, the hills to the east parted and she saw a flash of green, so much brighter than the unhealthy trees that survived alongside the smoke-shrouded railway lines and manufacturing towns. She longed to see those glorious colours up close. But if she could not walk then she could hardly leave the tracks. She kept the train running, and it in turn carried her from place to place. They passed a long abandoned siding, and she noticed old abandoned rails heading off to the east. Their rust gave them a warmly comforting look compared with the hard grey of her regular rails. Maybe they could lead her beyond these steep-sided valleys that protected the trains from weather and attacks. Perhaps then she could see the world. “Samar?” She swung around in her harness to face the Cabin Man, one of the few train staff allowed up here, men and women who constantly attended upon her, both to tend to her needs and to supervise her decisions. “Yes?” he asked, peering up from his newspaper across a pair of half-moon spectacles. The doubt in his voice told her everything she needed to know. The Committee were old and set in their ways. They would allow no disruption to the all-important timetable. Elenna could try that route, make request after request in the hope of eventually wearing them down. Or she could try something else. She made a retching sound and curled her body over as if in pain. She let the words trail off and her head hang slack. “Oh my Gods and Gears! I must fetch the doctor.” Samar rushed out of the cabin. The minute he was gone, Elenna reached into the narrow brass tube containing the cabin controls and flipped a switch. The door slammed shut and the lock clicked. Smiling and humming to herself in excitement and pride at her boldness, she looked for the next junction she could take. Half a mile ahead, a signal indicated a choice between keeping going and turning down the rusted rails towards who knew what. She yanked on a pulley, and a moment later the signal changed. The whole train shook as they went left, off the main rails and towards a gap in the hills. The tracks here were not well maintained. The cabin shook up and down. 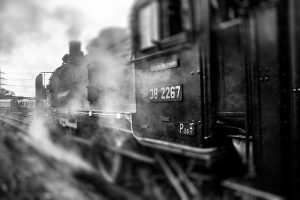 The train lurched, and looking back through a system of lenses and mirrors, Elenna saw a buckled track give way beneath the rear caboose, which stayed on the rails only through momentum and the power of the carriages pulling it. Several people were beating on the door now, shouting at her to stop. She didn’t listen. She had come this far, and she wanted to see what lay beyond. Already they were passing cleaner rocks, greener trees, and the bright colours of flowers she had only seen in picture books. “You’ve going to doom us all!” someone screamed as rotten sleepers snapped beneath them and rails bent inward, screeching against the wheels as Elenna forced more steam into the pistons, determined to keep them going. Everything was shaking. Her teeth chattered against each other and her vision blurred. The hammering against the door had turned into loud, steady clangs as someone brought a sledgehammer to bear. The track headed up a hill. Straining on levers and pulleys, Elenna kept the valves open, kept the train running at the limit of its power. Steam poured from a ruptured pipe, scalding one of her legs. She didn’t care. This was it. This was her moment. The door burst open with a deafening clang just as they crested the hill. Elenna pulled on the break lever, venting the steam that had poured into the pistons, and stared in wonder at what lay in front of them. The hillside was green with grass and bushes. It ran down to a length of golden sand, beyond which blue ocean stretched to the horizon. Tears welled in her eyes at the wonder of it all. Samar grabbed her by the shoulder and spun her around. “We can go back now,” Elenna whispered. She closed her eyes, remembering the green, gold and blue she had just witnessed, the openness of a world without limits lying beyond her cabin. She would always have that sight. If you enjoyed this story then you might also enjoy my steampunk short story collection Riding the Mainspring. You can get a free copy of the e-book by signing up to my mailing list at this link. You can take yourself off the list whenever you like and still keep the book, and as long as you’re on there you’ll receive more free fiction and news on new releases straight to your inbox.